It takes a lot of big-hearted people to turn 10,000 children into eager soon-to-be readers. 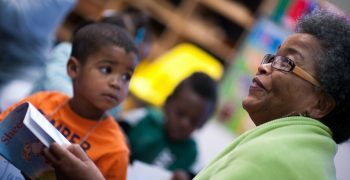 When you give to Ready Readers, you support storytime inside the classroom and in homes across our region. You fill young minds with big ideas and open the door to a world filled with promise. Truth is, we couldn’t do it without you. All Ready Readers funding comes from individuals and corporations who believe, as we do, that every child deserves the gift of literacy. Maybe you do it to inspire smiles. Or honor a loved one. Or make an investment in your community. Reasons for giving differ, but the effect is the same. 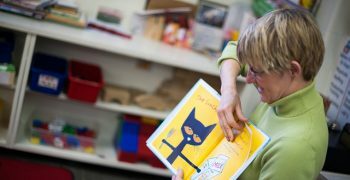 Together, we’re developing a new generation of readers, training volunteers, and stocking shelves with high-quality preschool books. Our small staff works to minimize overhead costs, so your TAX-DEDUCTIBLE donation goes further. 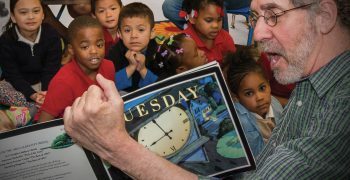 Literacy Society members are those who give an annual individual gift of $1,000 or more to Ready Readers. 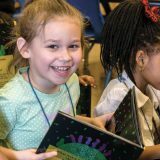 These generous gifts enable our literacy efforts now, while also helping to fund future growth of our programs. Donations of sturdy bookshelves for our preschool classrooms are also appreciated. 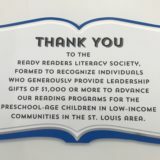 For more information about in-kind donations, please contact Nora Steele, Book Coordinator, at 314-402-7800 or nora@readyreaders.org. in a school for one year. in a classroom for one year. in a classroom for one semester. classroom of children for one year. for a child for one year.